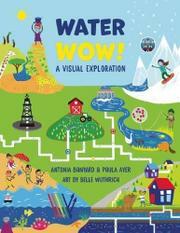 An effervescent dive into water’s nature, use, misuse, and conservation. Appropriately enough, the authors pour facts and statistics around and between reefs of vivid infographics, bright cartoon images, maps, flowcharts, and tiny but cogent photographs. They cover water’s cosmic origins, its earthly cycles (“It might once have been dinosaur pee, or Cleopatra’s bathwater”), and its roles in both weather and climate. Turning to our relationship with the stuff, they then spoon out summaries of world water myths over a comparative table of flood tales from selected cultures and religions, examine water’s uses in agriculture and in alternative-energy production, and survey ways in which water becomes polluted. Introducing the idea of a “water footprint,” they top it all off with suggestions for both personal and collective ways of conserving fresh water and keeping it clean. Young eco-activists will gulp this down, and even less-motivated students won’t find themselves in over their heads.